Startups are important catalysts of economic and social transformation. They bring the promise of innovation to solve some of the world’s most pressing problems in areas like education, health, agriculture, ecology, and transportation. Usually aided by technology, startups offer agile and cost-effective solutions with far-reaching impact. They create jobs and spur healthy competition in the ecosystem. From Silicon Valley to New York, and from Tel Aviv to Bangalore, global interest in entrepreneurship continues to grow. A plethora of academic and private incubators and accelerators are acting as strong catalysts in this entrepreneurial ecosystem. As most founders have experienced, it takes painstaking effort and extreme passion for bringing an idea to launch. Many startups face existential issues right after their launch as they scramble to acquire and retain mainstream customers and to serve them well. Not many founders realize that launching a startup is only the beginning and early funding only provides inceptive validation. The real measure of success lies in how well the startup scales to deliver consistently superior value. In an environment of hyper-competition, a market advantage built mostly on new products is quickly lost. Over-focus on valuations, without viable business models, creates enormous risks for startups. Startups need to think beyond the “launch” and work on building sustainable long-term businesses. Economic downturn and challenges in the availability of risk capital since 2016 have further reinforced the fact that startups need to work with game-changing vision and sound business models for long-term sustenance. There are far too many approaches to building a successful Startup. While some emphasize strategy, others focus on experimentation. Some insist on developing business models, others on making exceptional products. Some believe in the Design Thinking, others in Lean Startups. Our experience across a variety of industries and startup stages has shown that while each of the above approaches brings useful lessons and perspectives, no one method is singly sufficient. Unfortunately, in the absence of a clear roadmap, founding teams often pursue multiple random approaches for building and launching startups. These are usually perceived as “flavor of the month,” and are met with muted enthusiasm by the startup’s stakeholders. Consequently, the startup gets drowned in the din of a flurry of activities while showing little or no improvement in internal efficiency or market effectiveness. Varied inputs from multiple startup mentors only end up confusing them further. New founders tend to lay too much emphasis on “launching”, and not enough attention to paid to the many moving parts that they will need to manage post-launch. They need a clear roadmap to help them navigate the maze of ideation, customer development, team formation and growth management. We need an approach that nudges startup founders away from the temptation of making ad hoc fixes and instead supports them in building a lasting and innovative enterprise. 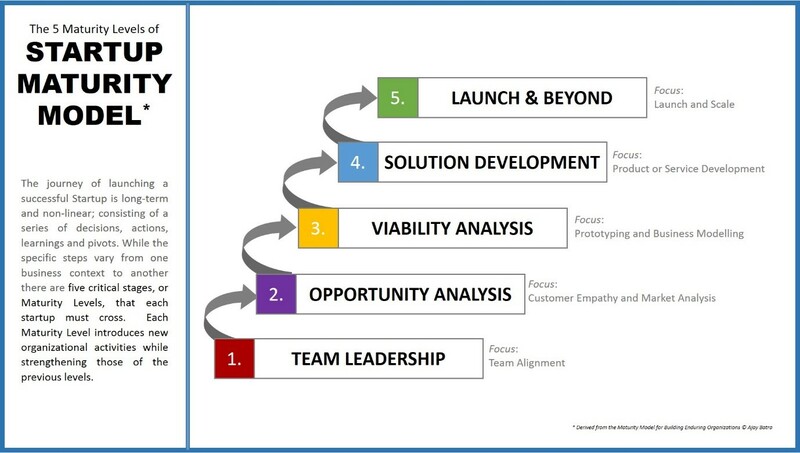 This is embodied in a unique framework* called the Startup Maturity Model© (SMM). This maturity framework is a global first in balancing the art, science, and practice of building successful Startups. SMM is a conceptual framework of insights and practices for launching great startups – it has been developed based on the success and failures of many technology, and non-technology startups from around the world. The lessons learned from these have been curated both as broad principles and specific processes. The purpose of Team Leadership is to ensure that a committed and balanced founding team is working towards a shared vision for the venture. Thus, the founding members commence the enterprise with an objective understanding of their motivation; as well as a shared understanding of their collective capabilities and resources. Team Leadership offers a platform for the founding members to openly discuss areas like roles, responsibilities, equity division and decision-making rights. This aligns the founding team to better manage the challenges and opportunities of the new venture. Team Leadership sets the stage for the new organization to develop a culture of transparency, trust, and continuous learning. The purpose of Opportunity Analysis is to ensure that ideas for innovative product or service are systematically evaluated for their business potential. Ideas for innovative products and services could result in new ventures, or they could result in significant changes within existing businesses. Either way, each idea is evaluated for its inherent potential and its competitive position in the marketplace. This entails viewing the idea within the broader ecosystem and from the potential customers’ perspective. The purpose of Viability Analysis is to ensure that the proposed product or service will be of value, and will be paid for, by identified customers. By solving problems that potential customers care about, or by satisfying essential customer needs, Viability Analysis ensures that the founding team is pursuing a venture that has a reasonable chance of success. Viability Analysis enables the founders to understand critical benefits that the customer expects from their products or service. Also, the founders develop more profound insights into other factors like distribution channels, costs, pricing and partners that are critical for developing a viable business model. Like Opportunity Analysis, Viability Analysis’s iterative, non-linear and learning-based approach calls for intense engagement with potential customers to understand their needs and wants. It also seeks to validate the assumptions about the intended benefits of the idea – before much investment of time and money is made in converting the idea into an actual product or service. The purpose of Solution Development is to leverage customer and market insights for developing products or services with appropriate functionality and pricing. This reduces the risk of spending founding team’s resources in developing solutions that may not be aligned with the needs and wants of the customers; or may have either too many or too few, features. Solution development entails mapping customer needs and expectations with the relevant product or service features. In a phased manner, the solution’s functionality is designed, implemented, tested, piloted and released. Solution development activities are performed in close coordination with other preparatory activities related to the launch of the venture. The purpose of Launch Management is to ensure that the founding team makes adequate preparations, within and outside the organization, before launching the venture. Indeed, one of the situations that Launch Management tries to avoid is for the founding team to rush into the launch with a well-designed solution, albeit with little preparation related to marketing, sales, and support. Post the launch, critical customer-centric and organizational factors are monitored to determine if the launched product or service creates the desired impact. Close attention is paid to the experiences of customers, partners, and other stakeholders during, and after, the launch. Launch Management also ensures that the founding team members develop a longer-term view of their venture’s success, and have envisaged strategies for continuing to deliver enhanced value and experience to its customers. At next level of granularity, each of the five levels in SMM contains 15-20 best practices which a Startup must interpret, contextualize and implement for it to successfully transform itself into a high-performance organization. Often, a startup or a founding team’s sense of its real potential is clouded by subjectivity, external perceptions, particular interest stakeholders, or quite simply, not having adequate information. Without a reliable mirror to accurately reflect organizational strengths and improvement areas, startups often go astray in their market strategies or internal plans. The SMM puts an end to this guessing game. Its well-defined maturity levels and assessment tools enable a startup to take periodic “health checks.” These checks help shape its vision, as much as they provide valuable ongoing feedback on what’s working, and what’s not, in areas such as strategy, planning, customer delight and people engagement. Just as the accuracy of the “You are here” pointer on the GPS defines how successful, or frustrating, your drive is going to be, an unbiased assessment of the startup’ s maturity, using the SMM, is critical for a meaningful commitment to action. * SMM owes its origin to the much-acclaimed family of Capability Maturity Models® (CMMs®) from Software Engineering Institute at the Carnegie Mellon University (SEI/CMU). These include Capability Maturity Model for Software, People CMM, and CMM Integrated. SMM is neither endorsed nor reviewed by Carnegie Mellon University or the Software Engineering Institute. Capability Maturity Model®, CMM®, and CMMI® are registered in the U.S. Patent and Trademark Office by Carnegie Mellon University.